Pomegranate's CatColor coloring book features 22 ever-popular Cat drawings by B. "Hap" Kliban. Each illustration is reproduced in a small, color version of the original artwork and as a full-page black line drawing. Coloring pages are blank on the back so they can be cut out and displayed. 48 pages. Dimensions: 8.5" x 11". 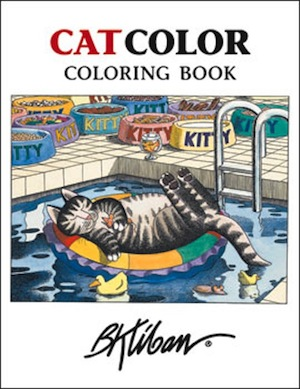 The last page of this book is blank so that you can draw and color your own picture of a cat, or your favorite pet, or any animal that you like to draw. Think about something the animal loves to do, and try to show that in your picture.